William McGonagall was arrested for murdering Patrick Kavanagh on March 3, 2011. He shot Kavanagh in broad daylight, at a cafe` in Brooklyn when a fight erupted about the check, following a fight over reviews the men had received in the New York Times for their writing. Both of which were very bad. McGonagall is known as a staunch atheist, and it came to be that he stood trial before a judge who was also an atheist. On learning this, he devised what is now known as the McGonagall defense. Rumor has it that it was a bit of a surprise to his lawyer. The judge agreed. He had already allowed McGonagall to proceed without swearing to tell the truth with his hand on the Bible, but rather with his hand on his own heart. “And as we are men of science, let us consider this event in light of the world as science tells us it really is, as a part of the history of the universe as a whole. This event, for which I am brought before you, is not part of the history according to Moses where in fallen man has chosen to sin against God, but rather we are all made of star stuff, a result of the Big Bang creating stars which themselves died so that we could form from their ashes. The judge agreed that they must. There was a mixture of laughter, shock, and offense in the courtroom. “But of course, “McGonagal continued, “they will say his heart did not stop beating due to natural causes, but because it was pierced by a bullet. And I agree. That is the most likely cause of his heart’s failure, and thus the resulting death. But again, I am not a bullet, and so I cannot have been the cause of the heart failure which is itself the cause of death. “And of course the prosecution will argue that the bullet was fired from a gun, and this is of course most certainly true. And so we see it is the gun which is to blame for the bullet being sent to his heart where in it caused the failure which ultimately killed him. “And before they say it, we both know they will claim that I was holding the gun, and it is true, I will not deny it. I was holding the gun which fired the bullet. But then, I was held by a chair, which itself was held by the floor of the cafe which is held by the earth, which is held together by gravity. All of these things are explainable by the laws of physics and chemistry. “So, shall we blame the force of Gravity for choosing to hold the earth together? Surely if it had not, then Patrick Kavanagh would not have been killed by heart failure that day. He probably would have asphyxiated in the cold darkness of space. Or shall we blame the chair which held me to my place? Naturally we would not, as a chair is comprised of matter and matter makes no choices. To think that a collection of formed matter, obeying the laws of physics and chemistry can make a choice and thus be found guilty is, we will all agree, absurd. “But what of the gun? Unlike the chair, it is made of complex parts, even moving parts, all working together, again, according to the laws of physics and chemistry. If the complex and interconnected parts of the gun did not do as the laws of nature direct, then Patrick Kavanagh may still be alive today. Shall we then blame the gun and have it punished for its role in his death? Once again, I think we will agree that, to think a collection of formed matter, obeying the laws of physics and chemistry can make a choice and thus be found guilty is, we will all agree, absurd. “Naturally we all know the argument the prosecution is itching to make. They have been chomping at the bit to make it the moment I started talking. But I will unveil their strategy. They wish to sneak in the Biblical worldview and replace the solid foundation of science with the worldview where in virgins have babies, donkeys talk, and dead mean get up out of their tombs. They will immediately reject the known and tested laws of science with their ancient mythology so that they can start making claims which we all, themselves included, have already acknowledged as being absurd! They will sneak in the history according to Moses, and with it the law according to Moses, and with it the already debunked and disproven idea that a collection of formed matter, obeying the laws of physics and chemistry can make a choice and thus be found guilty. We all agreed this was absurd in regards to the chair, an object whose matter came from the ashes of dead stars. We all agreed this was absurd in regards to the gun, another objects whose matter came from the ashes of dead stars, and an object far more complex than the chair. 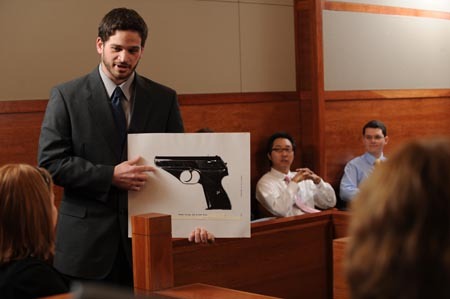 “Is there a level of complexity at which we would argue that the gun could be found guilty? Could the pistol evolve to the level at which it would be accused by the prosecution? They would freely admit that there is not. They would freely admit that the mere idea is FOLLY! And yet their entire CASE against me is that very case! For as men of science we know that life arose from non-living matter, and that every living cell is an object whose matter came from the ashes of dead stars. Every living cell, and every collection of cells is a collection of formed matter, obeying the laws of physics and chemistry. Men are animals, animals are collections of cells, and cells are made of matter obeying the laws of physics and chemistry. The laws of physics and chemistry cannot be broken, and thus the cells MUST obey those laws, and the animal which is made of those cells MUST obey those laws and the man who is one of those animals MUST obey those laws. “Yes, I was holding the gun, but as I cannot violate the laws of physics and chemistry, I could do no other, just as the gun could do no other than to fire the bullet, and the bullet could not choose to follow a path other than the one it did follow. To claim a man is guilty of murder, one must show intent, an act of will. But as I have explained, there is no act of will. Did my brain control the muscle contractions which resulted in the pulling of the trigger? Undoubtedly. But why? Because the matter in my brain making up those cells was obeying the laws of physics and chemistry. Matter cannot choose, and so the cells made of matter cannot choose, and even large collections of matter cannot choose, and so there is literally NO WAY I can be guilty of murder because there is no way I could have done differently that I did without violating the laws of physics and chemistry. I am no more guilty than the chair that held me, nor the gun that held the bullet. “If you wish to put on trial the collection of matter directly responsible for the heart failure which was itself the cause of death, then I say put the bullet on trial. Yes, the bullet did what the laws of physics and chemistry demanded that it do, but I did no other, and to claim I did is to sneak in the Christian notion of a soul, free will, and the ability to choose between righteousness and sin. If I am put on trial instead of the bullet, it is not only a mistrial of justice, but also a clear violation of the separation of Church and State. The case against me CANNOT be made with a foundation of science, but MUST first assume the Biblical worldview to be true and also assume that I have somehow violated the laws of physics and chemistry, which we all know cannot be done. William McGonagall returned to his seat to the sound of stunned silence. The judge, being an atheist, a man of science and reason… called for a recess. This entry was posted in atheism, Philosophy, The Creation SoapBox and tagged atheism, morality. Bookmark the permalink. Ha! This is well done. .1% of U.S prison population is atheist. Let that sink in while we talk about morals whiteout faith. Great job here. Hello Jim! I’d love to hear some reference for this amazing piece of information, because it sounds totally made up. Like, something an atheist would find on the internet and not have the sense to question because it defended atheism, and atheism is always accepted with blind faith by people who ironically call themselves “skeptics.” But naturally I can assume YOU didn’t just quote some cat related meme here, so, where did you get this number? Also, what does it have to do with the post I wrote? Because, from what I can tell, it has NOTHING to do with the actual content of the post except for a vague reference to the judicial system, but I’m probably just missing something obvious. Please explain it to me.